15 volunteers, across three days, put in over 100 hours of volunteering to support The Way – Youth Zone, as part of the EMC’s 12 Days of Christmas Campaign. 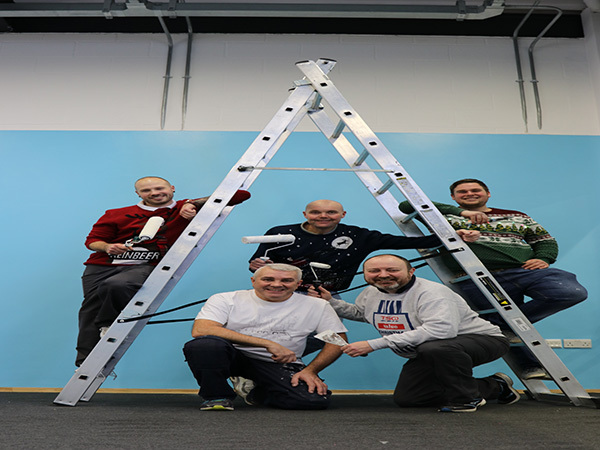 Donning their white jumpsuits and of course Christmas hats and jumpers, the team really got into the festive spirit, hanging wall paper and painting to spruce up some of the well-used areas at the city-based facility. Amongst the activities that the team took on were decorating the Media Room, Dance Theatre, Counselling Room and some communal areas. All of which made a huge difference to the aesthetics of the facility. All those that went remarked how much they had enjoyed getting involved in such an important project. Jaguar Land Rover is a founder patron of The Way – Youth Zone, which is a purpose-built facility for young people aged 8-19, or up to 25 with a disability. EMC employees are actively encouraged to look at opportunities to volunteer for a range of activities. For further information on how you can get involved click here.